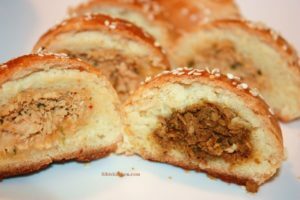 Hot stuffed buns! Hot stuffed buns! 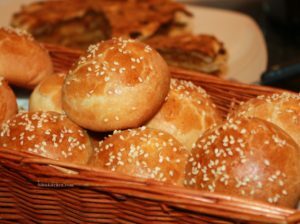 One a penny two a penny – Hot stuffed buns! Our adorable sons love them!!!! 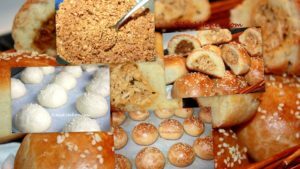 How to prepare Hot Stuffed Buns? 2. In a large bowl, mix together the flour,salt and oil. 2. Add the warm milk and yeast mixture gradually into the flour while kneading until you have a soft but firm dough. 3. Knead the dough, pounding it as much as you can to give the buns a delicately soft texture. The more you knead the better the result. 4. Cover the bowl with a damp warm towel and let the dough rise for about 30 minutes to one hour in a warm place. 5. Preheat oven at 350 F.Once the dough has risen to double the size, punch down, then knead it again for 2 to 3 minutes. 6. Make 15 balls out of the dough. Roll out each ball into a circle. Place your stuffing mixture in the center, pinch all the ends towards the centre to cover the stuffing and seal. 7. Place the stuffed buns on a baking tray lined with parchment paper, apply egg-wash and sprinkle with sesame seeds. 8. Bake in the preheated oven for about 10-15 mins. Anzzcafe has completed 1 year of blogging. You were amongst the first readers of my blog and your words were a great source of encouragement. Thank you for being a part of my small world.